LOWELL, Mass. - Junior goaltender Tyler Wall (Leamington, Ont.) 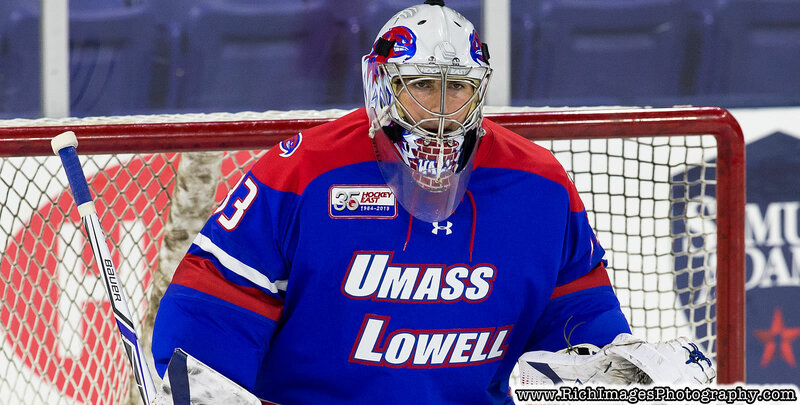 recorded 25 saves in his sixth career shutout to the lead the UMass Lowell Hockey team to a 2-0 victory and a weekend sweep against Vermont in Hockey East play on Saturday night in front of 4,244 fans at the Tsongas Center. UMass Lowell, who has now won five straight games, improves its record to 13-8-1 overall (7-4-1 HEA). The Catamounts dropped to 8-13-1 overall and 1-10-1 in HEA play with the loss. Junior alternate captain Mattias Goransson (Slottsbron, Sweden) notched his fourth goal of the year with a blast from the point that gave the River Hawk a 2-0 lead just two and a half minutes after the Dmowski goal. Goransson finished the night with a game-high five shots on goal, which included a failed penalty shot attempt in the first period. Senior forward Ryan Dmowski (East Lyme, Conn.) opened the scoring in the game with his seventh tally of the season at 10:21 of the first stanza. Dmowski's game-winning tally was his fourth of the year, which is a team-best. UMass Lowell outshot Vermont, 32-25 for the game, which included a 19-4 advantage in the opening frame. The River Hawks were a perfect 5-for-5 on the penalty kill on the night. Wall stopped 12 shots in the second period, while Vermont's Stefanos Lekkas recorded 30 saves in the losing effort. The River Hawks return to action on Friday, January 25th at Boston College. Game time from Conte Forum is 7 p.m.